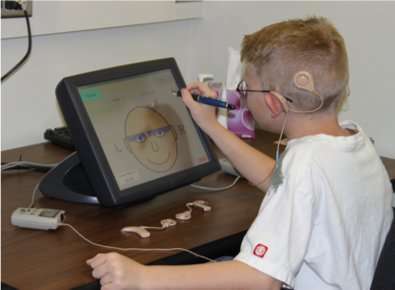 Using both ears to hear increases speech recognition and improves sound localization. In essence, it helps you to identify a friend's voice so you can follow her amusing anecdote over the din of a cocktail party. Ruth Litovsky, a researcher at the University of Wisconsin-Madison, wants to bring this advantage to people who use cochlear implants. "Twenty years ago, [the medical community] decided to give [deaf] people two implants, one in each ear, to see if it would improve their ability to hear better in noisy environments, so that children could integrate into classrooms and adults into the workplace more easily," Litovsky said. "I believe bilateral implantation has had a significant, positive impact on their quality of life, but they still struggle with noisy environments." "The first time I present a [deaf] child or adult with sounds that are truly coordinated, their face lights up as they experience that aha! moment where they truly hear stereo sound," Litovsky said. "The goal is to make this method work outside the lab, but it remains a challenge from an engineering point of view." Cochlear implants do not restore the ear's ability to pick up soundwaves. Rather, these surgically implanted devices bypass the damaged inner ear and translate sound into electrical pulses that stimulate the auditory nerve. The Food and Drug Administration has approved the implants in children as young as one year of age.